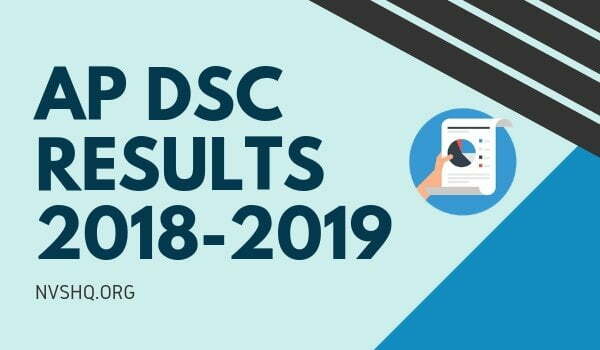 AP DSC Results 2018-2019 @ apdsc.apcfss.in: Here, is a good news for all the AP DSC candidates. AP DSC has been released on 15th February 2019. Candidates those who have appeared in the TETCumTRT SA, SGT, TGT, PGT, LP written exam will be able to see their Andhra Pradesh District Selection Committee Teacher’s Recruitment result from 15th February onward @ apdsc.apcfss.in . AP DSC has recently published the answer keys to the question paper of TETCumTRT SA, SGT, TGT, PGT, LP. Many candidates filled objection against the initial answer key. Considering the objections, a final answer key was released which is currently available on the website. Now, all the candidates are looking for the AP DSC result 2019 will be happy to know that the DSC result is soon going to release. To get detailed information related to AP DSC 2019 result, readers can scroll down to read the complete article. In this article, we have shared all the necessary information regarding the result such as AP DSC result date, procedure to download result, merit list, qualifying marks, cut off marks etc. 2 How to check AP DSC result? 4.1 What after the declaration of result/ merit list? AP DSC is a state level examination conducted for the recruitment of teachers for various schools in the state of Andhra Pradesh. Recruitment is organized by the Commissioner of School Education, Government of Andhra Pradesh for the recruitment of School Assistants (SA), Secondary Grade Teachers (SGT), Language Pandits (LP), Physical Education Teachers (PET), Music, Craft, Art & Drawing in Government, Zilla Parishad, Mandal Parishad, Municipal and Tribal Welfare Schools in the State through District Selection Committee (DSC). The recruitment process is organized for filling 7729 posts in the state. DSC selects the suitable candidate for all the vacant posts on the basis of a written test. The written test for all the posts was conducted from the month of December 2018 to January 2019. AP DSC result 2018-19 and Merit List has been announced now. Candidates can check it from below links. How to check AP DSC result? Candidates have to start by visiting the official website of AP CSE (https://apdsc.apcfss.in/). They can also check the result PDF here in this page. After accessing the official website, candidates will land to the homepage of the portal. On the homepage, candidates have to click on the AP DSC result link. On clicking the result link, PDF of the selection list will appear on the screen. Candidates can find their names in the list. Lastly, candidates can download the selection list for future references. AP DSC result will be announced as a provisional merit list or selection list. This merit list will be published in a PDF format. Candidates can easily download this result PDF. The selection list will indicate the names of the candidates selected in AP DSC written test. Apart from the names of the selected, it may also indicate their roll number, enrolment no., district, post for which candidate has applied and related instructions. Candidates have to find their names in the merit list and have to follow the instructions provided in the list. Candidates who have appeared in the written test will be selected mainly on the basis of marks scored in the test. Therefore, candidates must secure at least passing marks so that they can qualify the exam. They only those candidates will be selected who will score minimum required marks in the written test. The selection/ merit list will only be prepared on the basis of performance of the candidates in the written test. Candidates falling under different categories has to score minimum qualifying marks assigned for that category and post by the conducting authority. Cut off marks are the minimum marks required to by the candidates to qualify an exam. The cut off marks depends on the various factors. These factors include total number of vacancies, total number of applications, total candidates appeared in exam, difficulty level of exam, marking scheme etc. We will upload the all district cut-off here. AP DSC result will be declared in the form of provisional merit list. The result will indicate the names of the candidates according to the merit. The merit list published by the conducting authority shall be final. There will be no provision for rechecking or re-evaluation of answer sheets. Hence, no request for rechecking and re-evaluation of answer scripts will be accepted under any circumstances. What after the declaration of result/ merit list? After the publication of provisional merit list, selected candidates have to exercise the job/posts options and have to submit all the required documents for verification at the DCS. The documents include earlier TET score by original marks memo/card, Original Qualification certificates, age proof certificate, Original caste/category/PHC/Sports and Games and other necessary certificates. After the verification of certificates and issue of the posts to the candidates as per their eligibility, a final selection list will be prepared and published by the concerned District Selection Committee (DSC). The final merit list or selection list will be prepared on the basis of marks in the written tests, document verification, and choices exercised by the candidates. After final selection, selected candidates can join the respective job of the management like Govt./ZPP/MPP/Municipality/ Tribal Welfare etc. allotted to them. The final selection list will be published online for the information of candidates and will also be displayed on the notice boards of the office of District Collector, office of District Educational Officer and other concerned departments of the state. The number of candidates selected will be as per the number of vacancies. It shall not be more than the number of notified vacancies. Therefore, no waiting list will be there. In case if a seat is not filled by any reason then the posts/ vacancy shall be carried forward for future recruitment. If you face any problem in download AP DSC result 2019 then you can ask us in the comment box. Our expert team will help you in solving it ASAP. hello anybody contact this number for any information about ap dsc 7989822381 plz. Sir/Madam , Good morning. When PET(post) result. Next certificate verification ki ekkada attend kavaali pls inform. I am living CHITTOOR district.tirupati. Sir Apdsc cut off marks pettara? All district vi? Sir kurnnol dist st women catoff marks yentha? When I wrote online test my paper1 marks are 33.5 and paper2 marks are 54 I belong to occupy female category applied for principal post but the merit is displaying the top mark is 67 how can I resolve my problem.